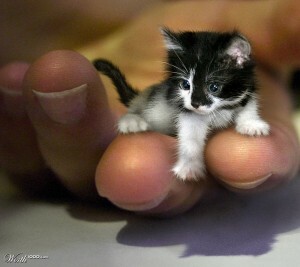 Is that a picture of the world’s smallest cat? Apparently a lot of people on the wwwaffler think that it is. But sadly, not. On a more serious feline matter, I note that the blog Counting Cats in Zanzibar seems to be suffering very badly just now, although I would love to be corrected with the news that it is merely me that doesn’t know how to get to it and all is well. As I recall, they lost all the comments - as in: their software refused any longer to display them. Presumably some kind of rebuilding process is now under way. Hope so. I wish them a speedy recovery. LATER: Sorted - I think. Again: hope so. Wow! Looks real so I can see how people think it is.